As always, Jef Cashless and friends are gonna be bringing the classic treats and the new heat this and every Thursday to Sugarcane, the newest lounge on the less douchey side of Washington Ave. This week’s guest is Dj Dayta from NanaChill. We’re gonna be holding it down with classic soul, funk, reggae, hip hop, house, afrobeat and whatever else we feel like rocking! Don’t forget to ask about the drink specials. You know what? SXSW is in Austin. However, where we live is called Houston. Unless you’re independently wealthy or lucky enough to take a few days off and go party like an idiot for the rest of next week, you’re stuck here. Blah. Afrobeat, Disco, Reggae, Funk, Hip-Hop, House, Soul, and more. 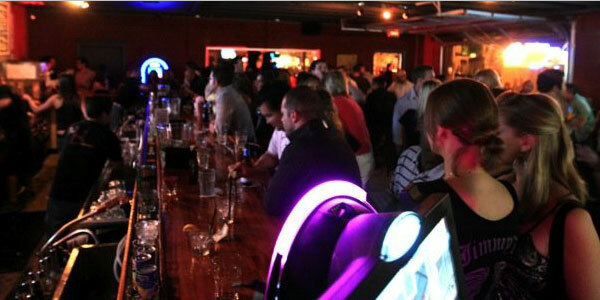 Drink specials all night: $2 domestics, $3 wells and $4 frozen mojitos. Plus, the party is FREE. Beat that. 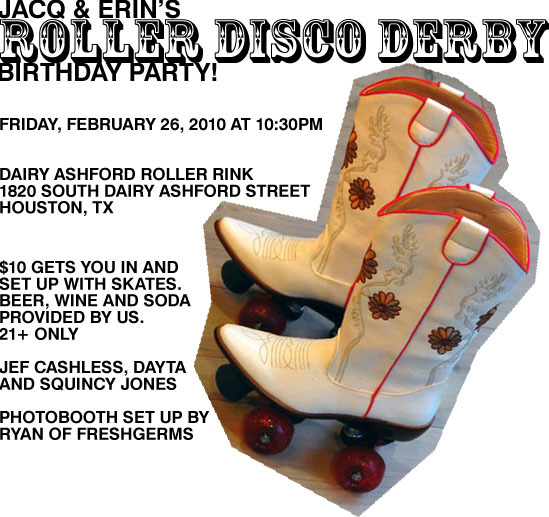 02/26 FRI :: Houston :: Disco Roller Derby @ Dairy Ashford Roller Rink w/ Jef Cashless, Dayta & Squincy Jones :: 10:30pm-2am :: FREE BEER & WINE !! Come out and celebrate Erin and my birthday this Friday. $10 gets you in and set up with skates. Beer and wine will be provided. Noise provided by Dayta, Jef Cashless and Squincy Jones. Photobooth by Freshgerms. Roller disco derby themed, so I want to see short shorts, fishnets and loud make up! I’m pretty excited about this one! Primarily because it’s my first roller rink gig ever and secondly because we’ll be rocking nothing but disco, disco re-edits, modern soul/boogie all night long! Roller skate jams in full effect!!! Oooh and free beer and wine with your entry fee?!! What? For serious? Yey mayne, for serious! You miss this, you lose. Period! 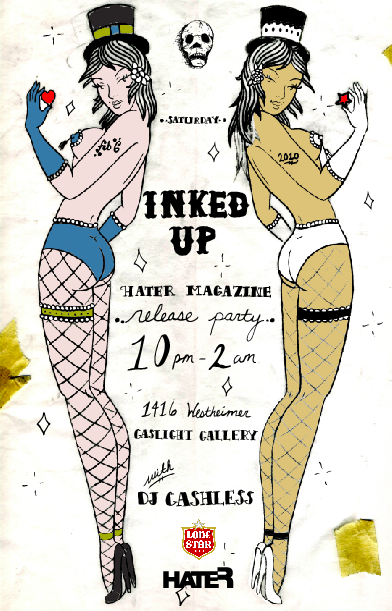 Our buddies over at Hater Magazine are having their Spring 2010 issue release party and they invited your dude, Jef Cashless, to handle sounds for the evening. The theme of the issue and party revolves around tattoos, so they’ve held it at Gaslight Gallery and named the party, Inked Up. 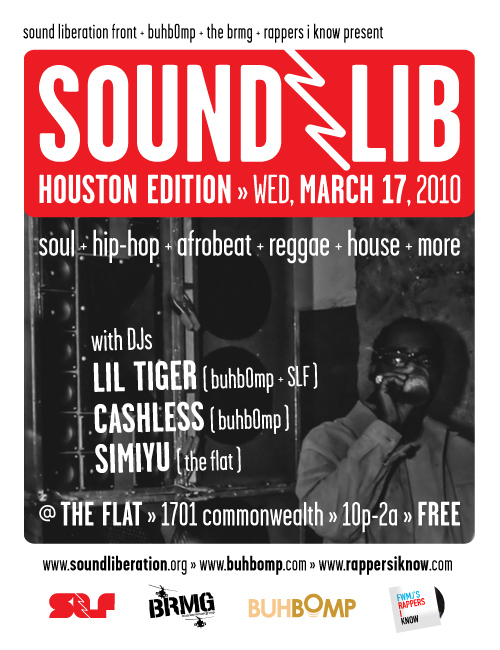 Shout to V. Chaba on flyer details. Haters always get it rocking. Don’t miss it!!! You might hear some hip hop and then some more hip hop and then a little more of hip hop (and maybe some Lady Gagg-Gagg). + $1.50 Any bottled beer in the house = Win! 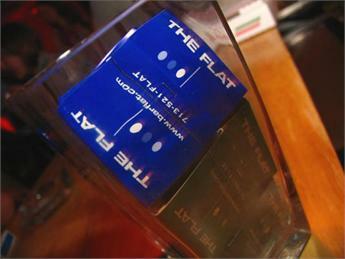 Join ya dude, Jef Cashless at The Flat, every Friday from 10pm til 2am. I’ll be spinning classic hip hop, 80′s, house, reggae, soul, disco, electro, b-more, funk & whatever I feel like. 1701 Commonwealth St | Houston | FREE! 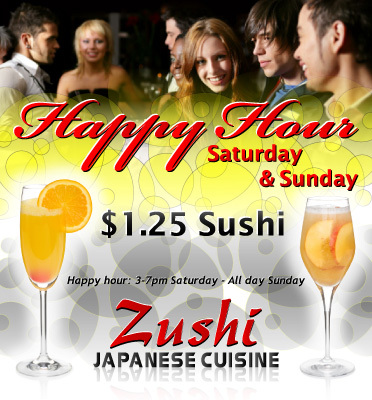 Catch ya boy Jef Cashless, spinning new wave, house, electro, broken beat, 80’s, rock, hip hop and maybe even some top 40 at Zushi Cuisine and Bar. We, like all the other decent people in the world, have been profoundly affected by Michael’s passing. I still can’t really believe it. So this month’s Welfare is dedicated to the man who changed all of our lives for the better. None of us would be DJing right now if it wasn’t for this man’s music. I’m not that into the re-workings of masterpieces, but these are a few standouts that I feel are worthy of sharing. enjoy. A jazzy, midtempo re-edit that adds a little kick by Oslo’s Todd Terje. Check the breakdown and build up. Perfect! New York producer / DJ duo Beatnick & K-Salaam come correct with their take on a Jackson 5 gem. Originally written by Marsha Ambrosius of English duo Floetry as a single for Michael Jackson’s Invincible in 2001, this track was later released on their debut Floetic the following year. A dark, downtempo to uptempo and back again rendition (with a dash of dubbyness) of a normally funky track by buhbOmp resident producer Joey Honey. My favorite! No remix, re-edit or revamping necessary for this feel good, dance jam. Guaranteed happiness every time I play this tune. Off of the Maybe Tomorrow LP. DJ-friendly intro on this remix. In all it’s extended glory. Classic. Classic. Classic. It’s the gift that keeps on giving. Try to find something about “Tim & Tim” online, I dare you. That’s not what matters here. What does matter here is that this funky updated italo-ish is business. Cop accordingly. When world’s collide, beauty happens. De La employs a fairly straight forward sample of the intro to MJ’s I Can’t Help It and the rest is magic. Another excellent Michael Jackson re-edit by U-Tern. You might not have heard “Hot Street” before, but here’s a little background for ya. Written by Rod Temperton and failed to make Michael’s album, Thriller, as Temperton and Quincy Jones didn’t feel it was strong enough. A great remix, although I think it loses some of the emotion of the original. Some strong funk on this joker! The horns are big, the bass heavy… This stomper was made to move people and King Most helps the dj’s deliver it to the masses! 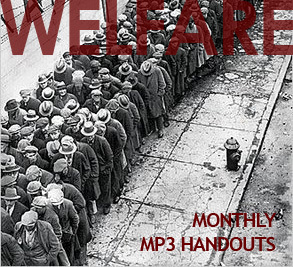 Don’t forget to check out our Welfare archives. We host all our Welfare downloads off-site, so what you need to do to download them is to click on the song name in the post, and then look for a download link on the page that that takes you to. - Click on the name of the song. That will take you to a divShare page. - On the divShare page, look for the black circle with an arrow pointing down. Below that arrow is a link that says “Download original”. Click that link and after a few seconds, the download should start automatically. If the file is hosted on some other site besides divShare (like ZShare or MediaFire or something) then just look for a link on that site’s page that says download. When you click on the download link, it will probably do something similar to divShare and make you wait a handful of seconds before it starts the download (or offers a specific link to the download). Hit us up in the comments if you need further instruction. We’re here to help. Thanks. We’re about to get it (Fiyah) Crackin’ this 4th of July. We’re starting this thing off early, so bring a lawn chair for the fireworks and an empty stomach for the FREE cookout. 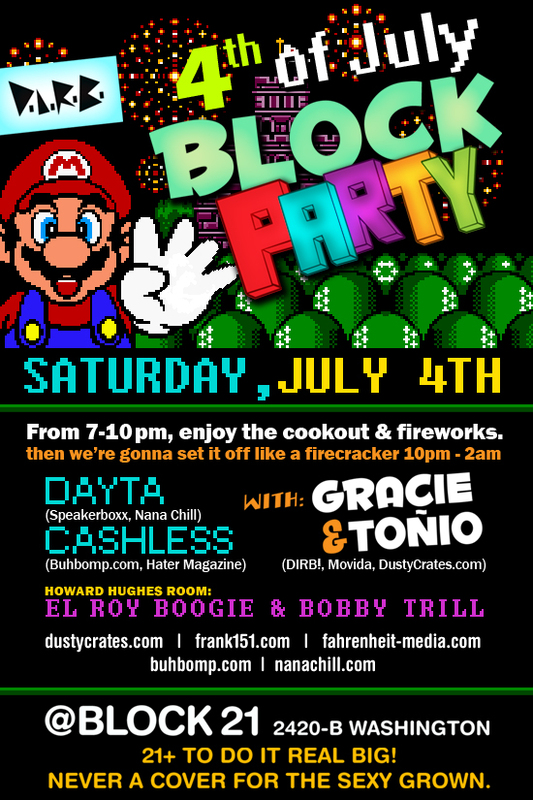 The first part of the evening will take place on the patio, so you can view the fireworks from a prime location. It will also be family friendly, so bring the kidfolk! Once the fireworks end at 10pm, we’re taking the party inside. 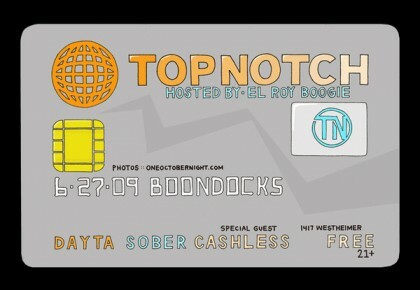 With Gracie & Tonio and guests Dayta, Jef Cashless (me), Elroy Boogie & Bobby Trill. Let’s get it (Fiyah) Crackin!!! 21 y up | FREE! | You must deal!